Advent Challenge - Time for a nice cup of tea? As I wrote last year: "I am a complete sucker for advent, on the one hand because I love the preparations for christmas, the candles, the build up. I like taking time to reflect and prepare for the arrival of that baby in the story. With both my boys, I found out I was pregnant in advent, so each year I look back with gratitude to Advent 2008 and 2010." 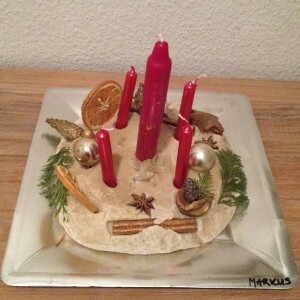 Markus' advent ring made at Kindergarten last week! I am advent woman, hear me roar!